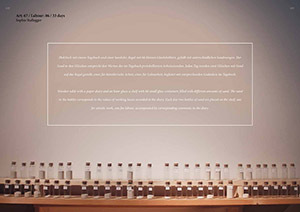 Each day two bottles of sand are placed on the shelf, one for art work, one for labour, accompanied by corresponding comments in the diary. The sand in the bottles corresponds to the value of my daily working hours. 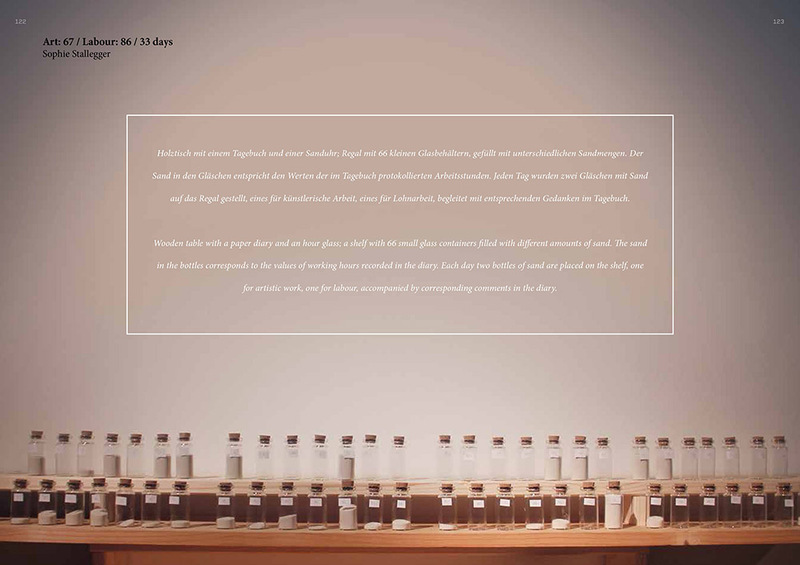 This process was protocolled for 33 days and showed the interplay between two different ideas of work during a certain period. It had a result of art: 67 h, labour: 84 h.
Interactive globe, that tells a story each time one is spinning it. The stories were collected from two long time travellers that conquered the world by bike. Of loneliness, freedom and restlessness. The stories are triggered through a manipulated computer mouse, fixed on the turning angle of the globe and a processing script. 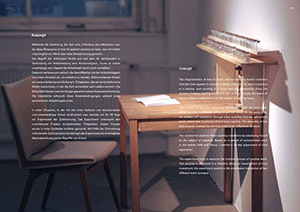 A fridge that confronts the visitor with their relationship to food. 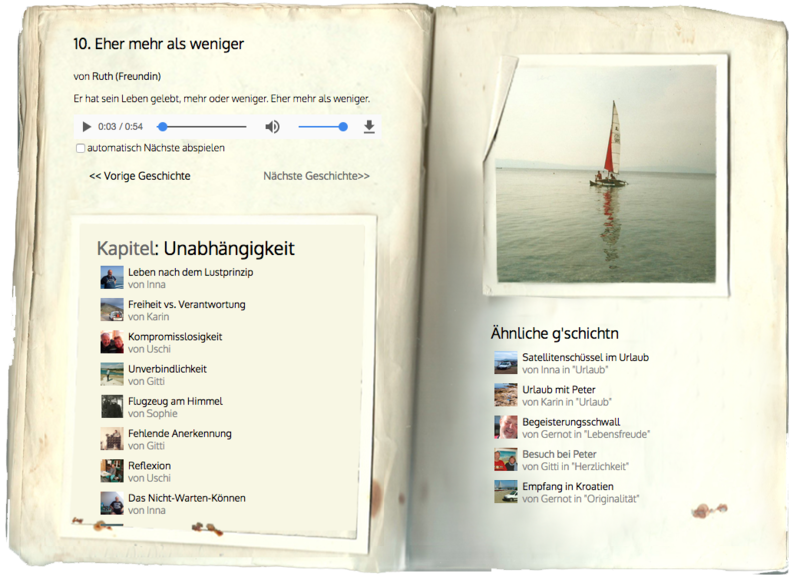 g'schicht'n is a digital memorial, a web-based audio book in memory of my father. I collected stories about his life by recording anektotes of friends and family and created a web platform that permits some facettes of his personality to survive for future generations. The content is linked by keywords to each other and the listener can navigate through it in a linear or an assosiative way. The content is accecible only for people, that have or request a password. g'schicht'n deals with the question, how to share and archieve rememberings of an abruptly ended life in a collective way and was my tesis project of my bachelor information design. Currently I am working on offering this platform for other people's stories as well. "Mittlerweile bin ich durch die ganze Seite "durch" - ich hab sie förmlich aufgesogen! Für mich ist dadurch eine Welt, die lange Zeit versunken war, von neuem erstanden und in mir wiederbelebt worden, die Welt, die Peter Stoisser war! Die lebendige Gestaltung durch die Tondokumente der verschiedenen Geschichten von großteils anekdotischem Charakter gestattet es, in diese Welt geradezu "einzutauchen". Vor allem wenn man die Personen kennt, die da erzählen, ist es, als säße man ihnen leibhaftig gegenüber im Teilen von lieben Erinnerungen." With Kinect and Resolume, we created an interactive screen, which reacts on the peoples movements. The visitor gets the possibility to experierence absurdity of club culture in a different environment.